Our learning experiences are unique and require we use our multiple intelligences to process information. We learn best and the fastest when the teaching and lessons match our individual learning style. While some of us are visual learners, others learn best by listening and communication or by touching and doing. The Circle of Learning™ blends visual and audible intelligence with kinesthetic intelligence to give you a learning system tailored to you for the best learning experience short and long term. You will revolve and evolve as you work your way around the Circle of Learning™ and through the course, the “knowledge transfer” becomes comfortable, impactful, and second nature. 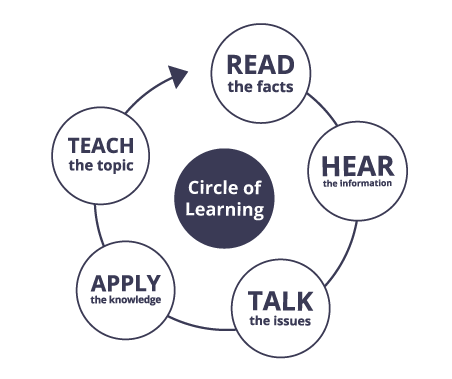 The Circle of Learning™ integrates multiple learning styles into all Coach Training Alliance courses and programs. The result is a multi-sensory learning experience that continuously guides the participant toward mastery in their chosen field. Review class notes, supporting articles, and library materials in the course software (included). Perform the Action Challenges and participate in Coach the Coach practicums throughout the program. Listen to the recorded classes, as many times as you like, for content and real-life examples. In the latter part of the course you will facilitate private group coaching sessions (optional). Interact with other coaches and ask questions of the instructors in live weekly mentoring groups.